The Great Bay is a tidal estuary located in Strafford and Rockingham counties in eastern New Hampshire. The Bay occupies over 6,000 acres, not including its several tidal river tributaries. Its outlet is at Hilton Point in Dover, New Hampshire, where waters from the Bay flow into the Piscataqua River, then proceed southeast to the Atlantic Ocean near Portsmouth. The northern end of the Bay, near its outlet, is referred to as Little Bay. Tributaries to Great Bay include the Bellamy River, the Oyster River, the Lamprey River, the Squamscott River, and the Winnicut River. The Bay is home to the Great Bay National Estuarine Research Reserve and the Great Bay National Wildlife Refuge (1). 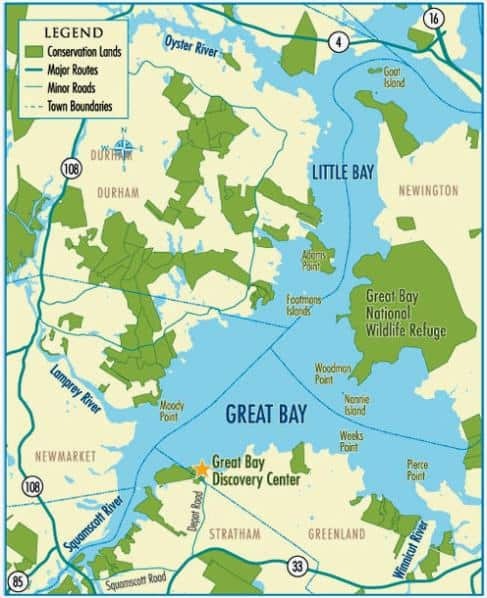 The Great Bay Reserve is comprised of upland forest, salt marsh, mudflats, tidal creek, rocky intertidal, eelgrass beds, channel bottom/subtidal and upland field habitats. The Reserve has a diversity of habitats: Adams Point/Crommet Creek is made up of field, salt marsh, and woodlands; Lubberland Creek and Moody Point are comprised of marsh, riparian and forested uplands; the Squamscott River Wetlands habitats include salt marsh, farmland and riparian; Wilcox Point includes riparian and forested upland habitats; Sandy Point is wooded uplands, vernal ponds, salt marsh and mudflats. If you would like to visit the preserved, open lands of the Great Bay there is a great visitor program in place called Great Bay Passport that not only opens up access points to visitors but makes exploring fun! Check it out. Also, feel free to review all of the visitor information available on the Great Bay Discovery Center visitor portal for directions, hours of operation, and facilities available to the public.